China now has more vineyards than France, a new report from the International Organization of Vine and Wine shows. It's bottoms up in China: Wine sales are on the rise and growers are anxious to bring more bottles to local drinkers. Chinese are enjoying a tipple once again after the government's crackdown on corruption and extravagance gave high-end wine sales a knock. Sales of wine, excluding sparkling, in China rose by 4.5% in 2014, reversing a 5% fall the previous year, according to Euromonitor. The country imports plenty of wine and is also developing its domestic industry to meet demand. Wine drinking in China is still a relatively new habit, but the global industry is seduced by the size of the opportunity as the population of about 1.4 billion grows richer and looks to spend money on Western luxury goods. Sales have grown steadily for most of the last decade as consumers become more educated about wine. Euromonitor analyst Spiros Malandrakis describes the market as "coming of age." Just five years ago, some wealthy Chinese were buying top shelf French wines for extravagant banquets and mixing them with Coca-Cola (KO), he said. Many of those lavish banquet tables have disappeared courtesy of the government's efforts to stamp out corruption, but French wines remain popular, along with varieties from Italy, Spain and Australia. It's all about the reds, and China sloshes down plenty of Bordeaux. Maladrankis said red wine matches local culinary tastes and the color is considered lucky. The perceived health benefits add to its appeal. U.S. wines are making some headway. China was the fourth biggest export market for U.S. wines last year -- 90% of which come from California. Now China wants to make more wine to serve local drinkers. It has more vineyards than France, according to the Paris-based International Organization of Vine and Wine, and is second only to Spain in having the most land dedicated to viticulture. But only a fraction of vines in China -- 5% to 10% -- are used for wine production. 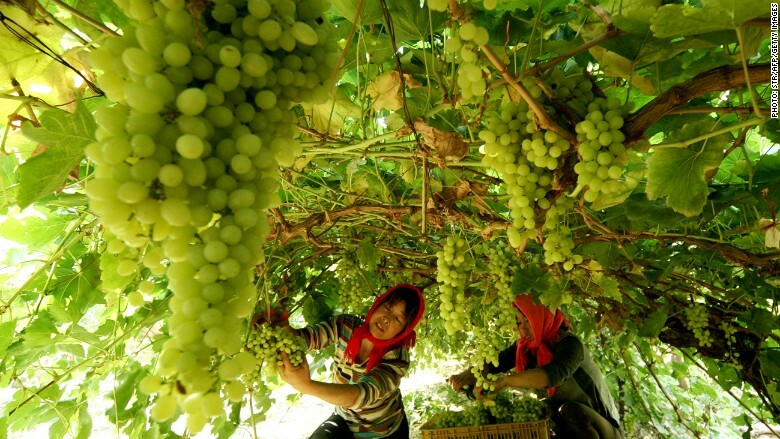 Chinese vineyards mostly harvest fruit, according to global wine consultants International Wine and Spirit Research. That means Chinese winemakers have plenty of scope to scale up production, but they are a long way from challenging the Old World masters. France, the world's biggest wine producer, made about four times as much wine as China last year. And twice the volume produced in the United States. The Chinese industry is increasing output and becoming more efficient, but still has to overcome concerns about quality and taste. Related: Prosecco: No longer the poor man's Champagne? Importing French expertise could help. Bordeaux-based Domaines Barons de Rothschild has a vineyard in Shandong Province, which produced its second vintage in 2014. But it's unlikely you'll be enjoying a glass of Shandong outside China anytime soon. "The quality of production is improving massively but it's light years behind France," Malandrakis said. "Exporting is very far fetched."